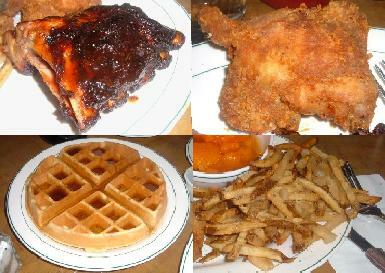 Rack and Soul is a great place to get your authentic soul food fix without traveling to Harlem. If that’s not reason enough, fried chicken luminary Charles Gabriel is a consulting partner at this diner-style restaurant. Mr. Gabriel’s serves his food buffet style at Charles’ Southern Style Kitchen on 151st Street, but those less adventurous can find crispy and moist fried chicken, sitcky, sweet, smoky and tender baby back ribs, sugary candied yams, and crisp shoestring french fries without straying too far from the 1 train. And yes, they also serve waffles.